Ed Sheeran's Lil' Martin is the perfect guitar to bring out the inner troubadour in us all. Superb on all counts. Solid build and neat finish. Impressive electro performance. Good value. Not as wide-sounding as rivals. We'd wager that Ed Sheeran may be one of the most popular Martin signature artists ever, in terms of the number of guitars he has sold for the company. Okay, so he famously plays the dinky and very affordable LX1E models, but in the past couple of years his ascending star has seen these Lil' Martins become, we're told, "as rare as hen's teeth". 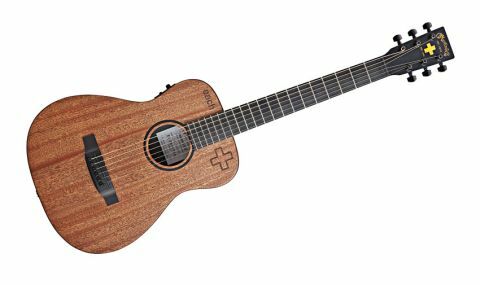 Well, the world of the 'travel' guitar has a new star: the LX1E Ed Sheeran. "Typically sharply built in Martin's Mexican factory, this guitar centres around a 584mm (23-inch) scale length with 14 frets to the body"
Typically sharply built in Martin's Mexican factory, this guitar centres around a 584mm (23-inch) scale length with 14 frets to the body. Nut width is regular at 43mm (1 11/16 inches in old money), and with a string spacing at the bridge of 53.5mm, it's only a little narrower than Martin's standard 56mm. Its top is solid sapele and very mahogany-looking, while the back and sides are 'jet black' HPL (as in High Pressure Laminate). Made from multi-laminate Stratabond, the nicely shaped neck with a 'modified low oval' profile has shallow shoulders and is extremely playable. That leaves the dense black bridge, fingerboard and head facing made from Richlite. This is a paper/wood fibre and phenolic resin synthetic material that has been successfully used by Martin, Gibson and others for fingerboards. Here it looks like high-grade ebony. Not surprisingly, Sheeran's chart-topping debut album, +, is referenced graphically on the guitar in the orange headstock emblem that sits below the classic 'CF Martin Est 1833' logo, and cheekily below that '+' is 'Est 1991', Sheeran's year of birth. A large '+' is cleanly laser-cut into the treble-side top; on the bass-side is the word 'each', an acronym of the charity to which Sheeran is donating all of his cut of the sale proceeds, East Anglia's Children's Hospices. That gets a round of applause from us. The final icing on the cake is the Fishman electro package with its under-saddle pickup and small side-mounted Isys T preamp. This has a rotary volume control, onboard tuner and push buttons for phase (to reduce feedback at high volumes or enhance bass at low volume) and contour (a preset tone modification). One of our favourite small guitars is Taylor's GS Mini and while that - with its additional magnetic soundhole pickup - is a pricier option, it certainly has more width to its acoustic sound in terms of low end. But the smaller-bodied LX1E, not least with its hardwood top, kicks out impressive volume if you hit it hard and it has a really quite delicate sweetness when fingerpicked. Its electro performance (through a Line 6 StageSource L2t) is impressive with a strong punchy voice, or, with the contour engaged, enhanced bass and treble with a midrange cut. The onboard tuner seems accurate and the display is bold and bright. So long as your PA or acoustic amp is of good quality, this lil' chap should really produce a sound that's way bigger than its physical dimensions. This well-priced signature package also includes a padded gigbag, and few could complain about the quality of the guitar's build, sound or playability. And, hey, whether you're an Ed Sheeran fan or not, it looks pretty cool, too.